Monster's Park Escapes the Room! 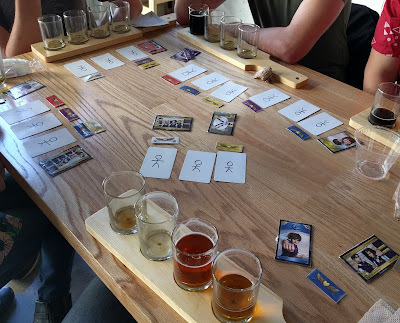 Do you like beers and board games? If so, you're in the right place. 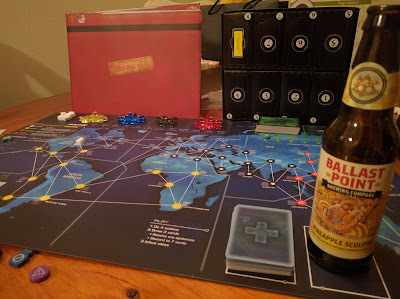 How is it that we continue to combine the most epic of beer and board games? (The honest answer is having friends that are into beer and free shipping on Amazon Prime, but let's pretend that question was hypothetical). Escape The Room Stargazer's Manor is an Escape Room game for your living room! You've been to a real escape room, right? If not, stop reading this post and go now! Seriously. Find one in your city now. Our group of friends has done several real-life escape rooms together including one in a Theater, Detective's Office, and one with a Zombie! Escape The Room Stargazer's Manor tries to bring that experience to your living room by delivering it in a small box. Start the timer and you have 90 minutes to solve all the clues and escape the room! We finished ours in about ~50 minutes, which we were pretty proud of. But I guess we're also all adults, so if you have kids it could take longer. The game itself has five main packets (and some of those have subpackets), so it feels like a good 10 puzzles you have to solve to win the game. This was a great first effort, and I'm very much looking forward to them releasing more of these in the future. So what did we pair this experience with? For those of you not familiar with Modern Times Brewery, they are the hottest brewery in the country right now. Based out of San Diego, they have expanded to multiple tasting rooms including one scheduled for Los Angeles later this year. They make everything from delicious IPAs to Saisons to Imperial Stouts to Sours. They are as obsessed with coffee as they are beer and may be the only brewery in the world that roasts its own coffee beans. This obsession has lead to one of their best creations, Monster's Park imperial stout aged in bourbon barrels. If you like bourbon, espresso, or chocolate, you have to try this beer! It is rated 97 on RateBeer and will make you appreciate life in a new way afterward. For any of you not sure what to do after you escape the room, definitely check out Modern Times 3rd Anniversary Party on July 9th, or their Festival of Dankness on August 13th, which is going to be the most epic IPA beer fest ever! August Update: We attended both of these Modern Times Events mentioned above, and they were epic! The 3rd Anniversary party had 15-20 amazing seasonal beers on tap, and the Festival of Dankness was right on the waterfront in San Diego and had over 100 of the dankest IPAs I've ever tasted. Hands down, Modern Times is the best. 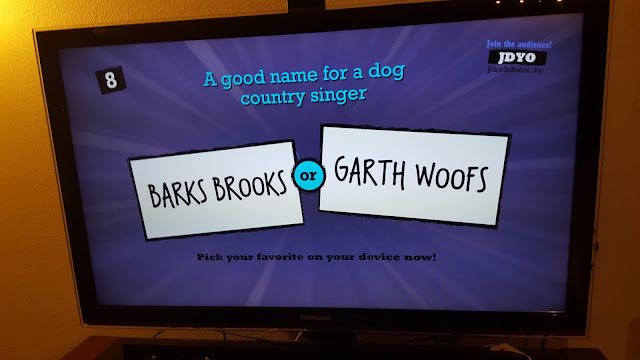 Quiplash XLdeviates from our usual table top game theme. This web-based, TV-projected game is unrivaled as a large group party game. It is similar to Apples to Apples, but everything is faster-paced and digital format. Your party host will pull up the game on a TV screen and a game code will show up. Anyone in the room (or actually anyone on earth) with the code can enter it at jackbox.tv on their smartphone. From there, players join and give themselves a nickname. Because answers can get exceptionally raunchy, some players opt for anonymity. But you can’t stay anonymous for very long as other players will quickly figure out who is who. Mayday! Mayday! is an epic social deduction game where all players are flight crewmembers aboard flight LK-886 when the pilot suddenly dies. Heart attack? Murder? The crew believes there are infiltrators amongst them! At the start of the game, one or two people in your group will be secretly assigned the roles of infiltrators while the majority of the group will be the honest crewmembers. The honest team wins the game if they get all the honest crewmembers into the cockpit. However, if just one single infiltrator gets in the cockpit, the game ends (boom)! Note: For sensitivity reasons, this game is not distributed in the United States (as you can imagine). Thus, I had to make it myself with cards (hence the stick figures drawings in my photo). 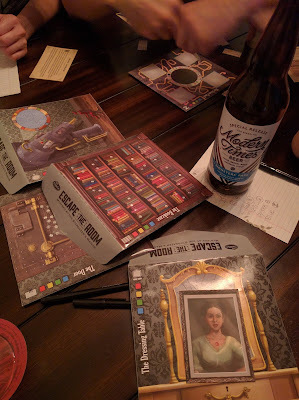 Nevertheless, this is an excellent game and an excellent addition to the social deduction game genre.